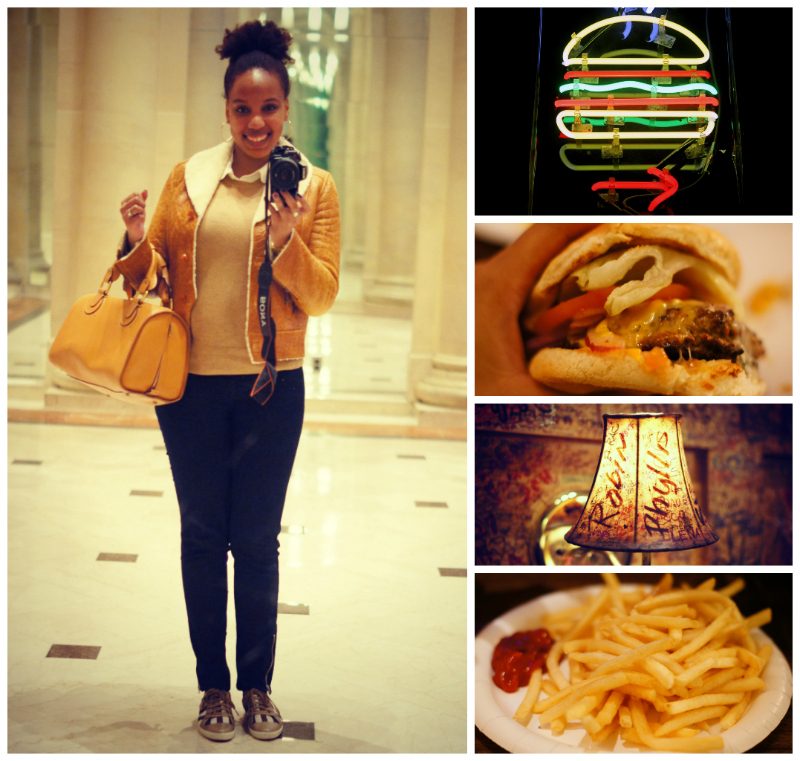 Today’s message is operating under the guise of an outfit post… but what I really want to talk about is one of my favorite (not so) hidden treasures in the city: Burger Joint. I consider myself to be somewhat of a burger connoisseur (feel free to email me if you want my personal list of first-rate picks), and in my opinion this place offers one of the top no-frills burgers in town. In addition to delicious eats, Burger Joint also serves up a really cool location. It’s discreetly tucked away behind a curtain in the lobby of the super-swanky Le Parker Meridien Hotel and operates kind of like a burger speakeasy. It’s always fun to see friends’ reactions when I walk them through the hotel’s posh mirror-lined and chandelier-trimmed atrium, only to wind up scarfing down fries out of paper bag in a wood-paneled room with graffiti on the walls 10 minutes later! So now that we’ve gotten burgers out of the way, I will tell you about today’s outfit which includes two of my best bargain finds by far. The first is my Chloe bag, which if you recall from a previous post, I scored for more than 80% off due to a combination of chatting up a lonely sales associate and a computer error at Bloomingdale’s. And the second is my surprisingly lightweight but oh-so-toasty shearling leather jacket that I scooped up at Daffy’s store-closing sale. Every time I wear this jacket it serves as a testament that there is truly no shame in my clearance rack shopping game as this beauty was originally priced at over $1000, and I nabbed it for under $100.